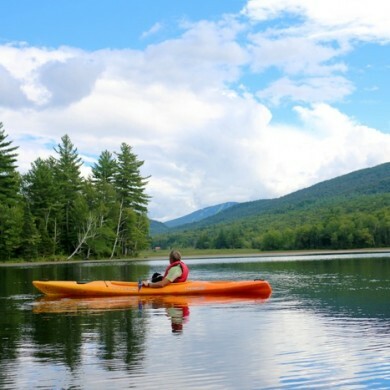 About a 30-minute drive from Killington Mountain Lodge, you’ll find some of the flattest water around – perfect for fishing, hiking, paddle boarding and kayaking. Ten miles north of our mountain resort sits a paddler’s paradise called Chittenden Reservoir. Surrounded by Green Mountain National Forest, the 750-acre lake was developed more than 100 years ago by a damming company – for the purpose of generating power. Today, its natural coves and bays are a serene spot with a devoted following of paddlers and nature lovers alike. Canoes and kayaks are available to rent along the shore. The waters and surrounding woods are home to many animals including moose, loons, bald eagles, osprey, beavers, waterfowl such as black ducks and mergansers, black bear, white-tailed deer, red fox and river otter. Adjacent to Chittenden is Leffert’s Pond, a small, 49-acre impoundment within the National Forest, used for fishing, canoeing and kayaking. Hiking trails are plentiful in these parts. One of our favorites begins at Leffert’s Pond, extending around Chittenden Reservoir to traverse babbling brooks and lush woodland ferns, with spectacular lake views between the trees. Rent your canoe or kayak near the lake, and paddle away. Just be back in time for dinner at our Killington Mountain Pub.